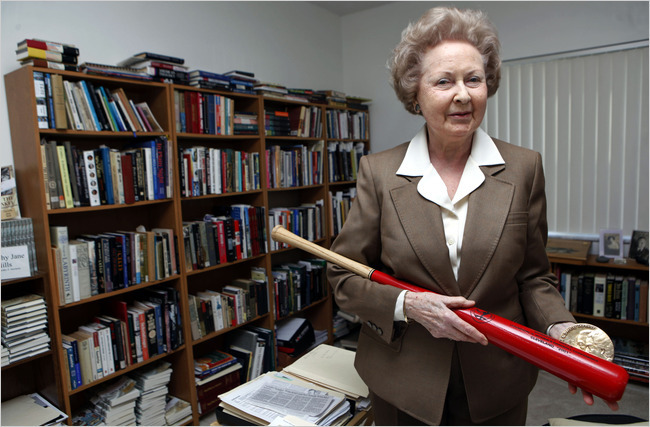 Nominations are now open for the 2019 Dorothy Seymour Mills Lifetime Achievement Award — "The Dorothy" — named in honor of Dorothy Seymour Mills and her lifetime of contributions to promoting women’s baseball. To submit a nomination for The Dorothy in 2019, please submit a letter of nomination (self or external); supporting letters; list of accomplishments with supporting documentation (including articles written by/about the candidate; book reviews for books written; links to organizations/tournaments/others that the candidate participated in or helped organize); awards received; or other achievements by October 8, 2018, to Dr. Leslie Heaphy by e-mail at lheaphy@kent.edu or by mail at Dr. Leslie Heaphy, KSU at Stark, 6000 Frank Ave., North Canton, OH 44720. Eligible candidates include any person with a sustained involvement in women’s baseball or any woman with a longtime involvement in baseball in any fashion — player, umpire, writer, executive, team owner, scout, etc. Candidates do not have to be living; it can be awarded posthumously. Self-nominations are accepted. The winner will be selected by the Dorothy Seymour Mills Lifetime Achievement Award Committee. SABR's Women in Baseball Committee established the award in 2017 and the inaugural recipient was professional umpire Perry Barber. This page was last updated September 17, 2018 at 11:21 am MST.